DOUBLETREE HOTEL/THE GRAND(1/1.5) Spectacular Bay View. exceptional bathtub, separate shower and marble floor. From either the livingroom or bedroom, oversized sliding doors open to the large balcony that contains confortable sitting, perfect to admire Miami's famous panoramic skyline views. Heated Pool in the 10 floor. Great condo with beautiful pool and views. Clean, comfortable, and great view of Biscayne Bay! Everything was perfect. Couldn’t have asked for more. Manny was in touch frequently and we never felt like we had an unanswered question. I've stayed at the Doubletree Grand many times, but I love Manny's condo. Very nice and updated and most important - a comfy bed. Will definitely stay again! The condo is clean and roomy with a great view. A nice park located right beside the building. Close to downtown and not far from Miami Beach. I would stay here again! Manny is very responsive to emails and our inquires, and very easy to work with. The building is 20 years old, and we found the soundproof is not great (happen to travel in spring break and seem to have more young partiers in the area at night). While appliances are in working condition, there are couple issues (dishwasher door don't close well). That said, overall, clean and spacious and we appreciated Manny's quick responses. Clean, many amenities and perfect location! Manny was awesome - communication was great. The condo was very accommodating and the amenities at the facility were well kept and easily accessed - Gym / Pool etc. The condo offers superb views and comforts of home, the close proximity to grocery, and restaurants makes the location that much more appealing. Additionally, it is only 15 min to South Beach! I Definitely recommend and will stay again when we go to Miami! 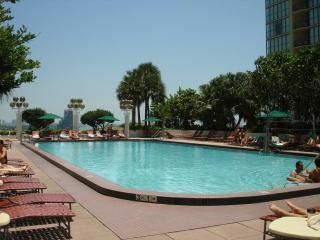 On the 10th floor, The Grand Condominium offers a large heated swimming pool, four spa tubs, lounge chairs, a full service bar, etc. that overlook the bay where cruise ships can be seen passing by. Come down to the lobby where The Grand / Double Tree Hotel connects with the Marriot Hotel. Newstands, bank currency exchange office, traveling office, conference rooms, mail room, convenient store, liquor store, sports bar, various restaurants, and fitness gym may be found. This 42 story building is conveniently located half mile from the American Airlines Arena, Bayside Market Place, and the world famous Gloria Estefan's restaurant and bar (Bongo's). The newly built Arts Center is just within walking distance. The Miami International airport is approximately seven miles away, and South Beach is about four.